Poodleism: Poodles and high fashion might not be a great idea. Poodles and high fashion might not be a great idea. I was getting my morning news on this morning and this caught my eye: I'm pretty sure the intention of this was to sell me a coat. Little did the advertising geniuses know, the poodle clearly caused me to click on a sidebar ad. Something I NEVER do. (Side note: who knew Lord & Taylor still existed? I didn't.) That got me thinking about poodles in fashion photography. I'm obviously all for it. I found a few weird things... One trend: COLORS. What the hell is this about? I'm not a fan of dying a live animal a color it shouldn't be. It even irks me when they have painted hermit crabs at pet stores. Beautiful Doris Day in 1952. The colored poodles bother me when I think too much about it, but I love this picture. 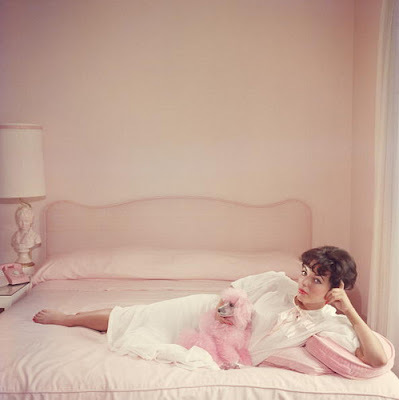 Joan Collins, another icon. It gives me the giggles that when this was taken in 1955, the photo and her nightgown were probably so risque. 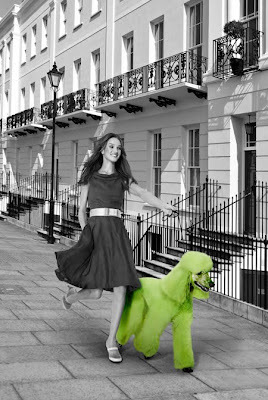 This one is an ad from London supporting some kind of "go green" campaign. Going green and walking your dog outside is definitely something I support, but did the dog have to be such an offensive and non-natural color? 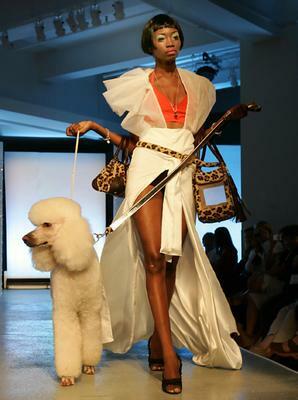 Another trend: Poodle as a runway companion. I'm not against this, but sort of don't understand. I'm too distracted to look at the clothes. A live animal is probably the only thing you could throw into the mix to take eyes off of this super skimpy swimsuit. This model has clearly never picked up dog poop. And if she plans to, she may need to re-think this outfit. Just a tip. Oh and also, what dog is supposed to fit in her carrier? Not that one. And then there is this (click here for a better resolution): Yes, that is a person acting like a dog. And popping out of a purse. And being disciplined with a newspaper. WTF? Welcome to my Thursday distraction. Happy almost weekend!